Large Family Friendly House on the Santiam River w/ Hobbit Door! 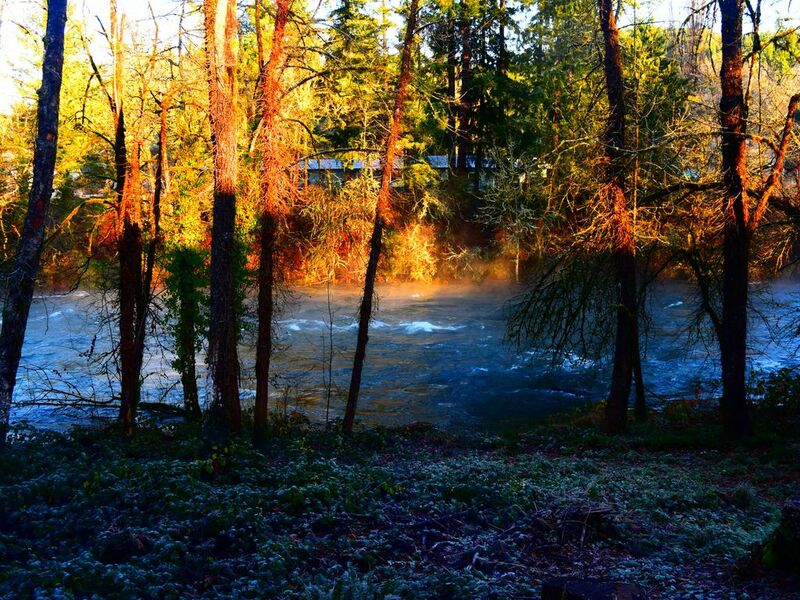 Enjoy a relaxing stay right on the north Santiam River at the Spring Shire House. A family-built 2014 house of ~3000 square feet to provide plenty of space for relaxation. It sleeps 14 and can handle more if needed. Nestled on the banks of the North Santiam River, it provides waterfront views and access for swimming, rafting, kayaking, or fishing. The house is fully furnished and waiting for you! The first floor contains a master bedroom and master bath, with jacuzzi bathtub and shower. Upstairs you will find 3 large bedrooms with spacious closets and queen sized beds. All rooms include a dresser and walk in closet. Also upstairs is 1 large bonus bedroom with 4 built in bunk beds plus a queen bed and a divan for kids. The bonus bedroom has a unique feature -- a hobbit door for an entry. Round, functional and fun, it is sized for the little people including a peephole. The room is decorated with Hobbit and Lord of the Rings posters and items to add magic to a child's imagination. There is also a stock of toys there for kids of all ages. There is a standard fire door for adult/emergency ingress and egress. 2 full baths upstairs and 1.5 baths downstairs keeps everyone happy. Bathrooms are already stocked with normal toiletries such as shampoo and towels. Throughout the house you will find bookshelves with books and/or movies to entertain. A smaller TV upstairs will let the kids watch videos or play on the PS2. Downstairs a large 55" TV provides adult viewing options, with both DVD and Blu-Ray capabilities along with cable. The house has wifi with 5G speed for internet devices and browsing. The kitchen is fully outfitted including incidental supplies and condiments. Includes a stove, oven, microwave, refrigerator and 2 deep sinks for ease of use. Cupboard contain a full set of dishes, glassware , silverware, cookware and standard spices for eating in. An ultra quiet dishwasher will handle the mess while everyone enjoys the activities on the first floor. The large island, with 4 bar stool chairs, create a casual eating place if desired. The great room contains a 12-person dining room table made from polished classic barnwood with matching benches, giving a great feel of country living. Next to it is a small kid-sized table with an inlaid chess/checker board and four chairs. There are additional tables/chairs in a nearby closet for even larger groups. The room continues to a large sectional couch, recliner, area rug and some chairs and stools. The entire side of the house facing the river has large windows and benches with storage and cushions to allow river viewing while relaxing, and plenty of seating. A gas fireplace completes the cozy room. Outside in the back is a concrete patio with quite a bit of seating, and was recently expanded to wrap around to form another river viewing area on the side of the house as well. If interested, pull the full size BBQ out from the garage and connect it to the propane outlet built into the house for grilling up a quick bite or slow roasting steaks. Feel free to grab the rafts, paddles and life vests out of the garage for a trip down the river (standard run to a nearby state park takes 90-120 minutes and runs through about 6 rapids, most Class 2 and one Class 3). Or perhaps fishing is your way of relaxing -- grab the poles and tackle box from the garage and see if you can land a steelhead or rainbow trout. Any visitor will be drawn to the river, with its relaxing hum and cheerful water swirls. It is shallow enough along the bank to allow easy swimming and wading for younger kids but wide enough to allow the rafters and kayakers to slide by with no more disturbance than a wave from the bank. Grab a chair and rest your feet in the cool water, or perhaps skip some rocks or just relax and watch the water. Mill City is a quiet town in the foothills of the Cascades and near multiple hikes, parks, and recreational opportunities. Many choices and some legendary pizza distinguish this hidden gem of a community. This house was built on property owned by our grandfather, who loved the river and passed that down to us. We use the house ourselves and want to share the relaxation and fun that we experience every time we visit. We hope you will enjoy your stay! 3 Full bathrooms, one half bath. This house sits directly on the banks of the Santiam River, with a bank of 6 windows on the river side ensuring that you will have a great water view without even going outside. This house is riverfront on the Santiam River! with over 100 yards of river property, you will have private and instant access to the water. Wall heaters in each room. Gas fireplace operated by switch. Garage contains amenities such as rafts, inflatable kayak, life vests, lawn games and misc home tools. Sectional couch that seats 8, Lay-Z-Boy recliner, black leather chair, area rug and window benches. Main dining table is finished barnwood with benches and chairs. Kids table with inlaid chess/checker board nearby. Cable TV with expanded basic channels. Blu-Ray player. Also a connected VCR. Two bookshelves with various books. Lawn games in garage, such as lawn polo or badminton. Closet full of children's toys in the Hobbit Room. House contains approximately 60 movies for both kids and adults -- some DVD, some VCR. Playstation 2 with various games. Large lawn on the east side of the house. Approximately 50' riparian area between house and river. Fire pit for outdoor campfires/roasting marshmallows about half way between house and river. Some adult and children's bicycles available for use in the garage. Back patio has picnic tablle with benches, patio table and 6 chairs, and side yard patio has black wire table and matching 2 chairs. Raft, paddles, life vests, fishing poles, tackle box. We loved the house and the beautiful setting! We had everything we needed! The house is well appointed! We all slept very well in the comfortable beds. It was just a great place to hang out with my Mom, sister and brother and our spouses! Absolutely beautiful home and view. Relaxing and comfortable. Our scrapbook group of 12-15 have stayed in this home for the last 4 years. It accommodates all of our needs as well as allowing us all to be in one room during the day. The river flowing just outside the windows gives us the calming effect we all look forward to while away as well as the warmth of the home. The kitchen is wonderfully stocked so we can eat in as we choose. Walks around the neighborhood are lovely . The home is cleaned and well maintained. We look forward to our stay next year as we have already booked it! Had a great weekend retreat with the ladies from our church. The house was great, clean, and well-stocked. The beds were comfortable. Sad the burn ban was in effect, so no S'Mores around the fire ring, but we had a great time with puzzles and games, plus a movie on a huge TV in the main room... The Hobbit door is an awesome feature! This house is the best stocked vrbo we've ever stayed at. Set up with everything our big family needed to have a blast. If I would have known just his well supplied they were, we could have saved a lot of packing. River location was a great place for little ones to play and order ones to float rapids. Comfy beds and pillows and lots of space to spread out. We'll be back. Thanks for letting us stay. Best view you can get from the river! Clean and spacious house with everything you need for your stay. Instructions are very informative.